ExPlay oio Nano Projector – It's Real And It's Small | OhGizmo! By Andrew Liszewski on 05/23/07 • Leave a comment! Here’s one piece of promised technology I’m happy to see making the move from cheesy 3D mockup to actual product. At the SID 2007 (Society for Information Display) conference in Long Beach, California, Israeli company ExPlay demonstrated their oio nano projector. Besides producing a high quality, bright image ExPlay promises the projector will always be in focus which is an important factor allowing the device to really be used anywhere. 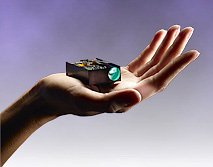 While tiny projectors like this can only produce an image about the size of a large monitor they’re not designed to be used for large audiences. Instead the idea is to provide an alternate means for one or two users to view content on a mobile device that is limited with a relatively small screen. And while the oio shown off yesterday is a standalone projector ExPlay has developed their technology so that it can be sold to OEMs and built in to almost any device. The company is planning to launch the oio in 2008 and I really hope they can deliver on time.